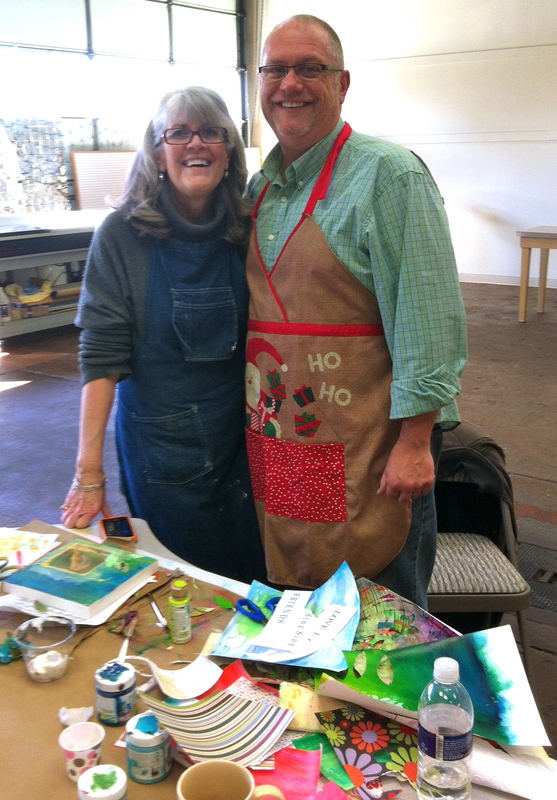 What a wonderful surprise to receive a phone call from my long-time friend Trish Lehman, inviting me to join her at a Mixed Media Collage class in Edmonds last weekend. Besides the opportunity to create in a medium I hadn’t really worked in before, I was excited to see Trish, as she’d just returned from a trip to ICELAND and I wanted to hear all about it! We agreed to meet, and I offered to pack a special picnic lunch for us. Caitlin doing what she does so well – making beautiful art! 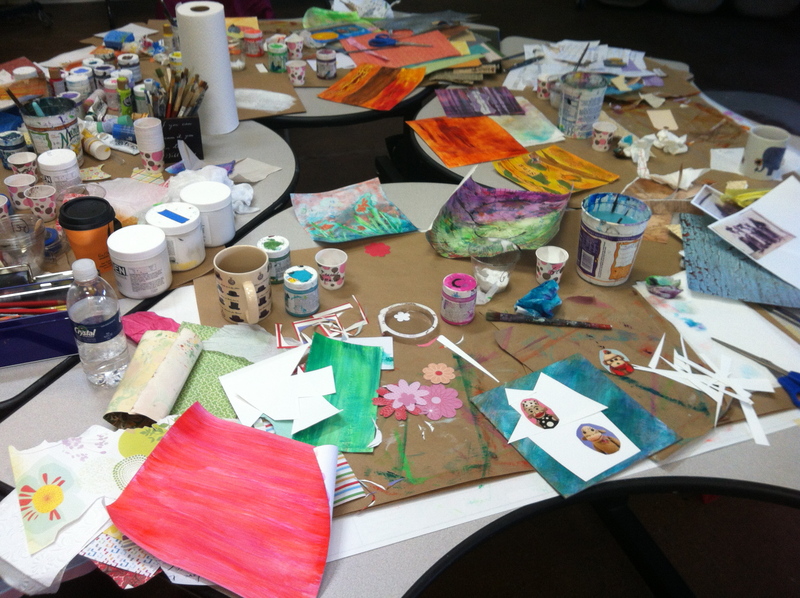 The all-day class was taught by an amazing Seattle artist, Caitlin Dundon, the owner of One Heart Studio. 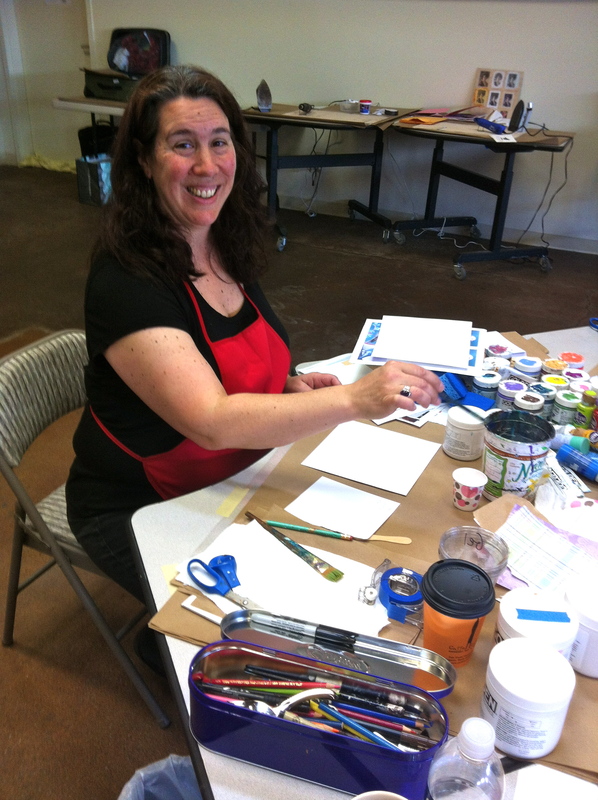 Caitlin is known for her trademark handwritten script and colorful mixed media paintings, and she’s a professional calligrapher and instructor in both mixed media collage and pointed pen calligraphy. 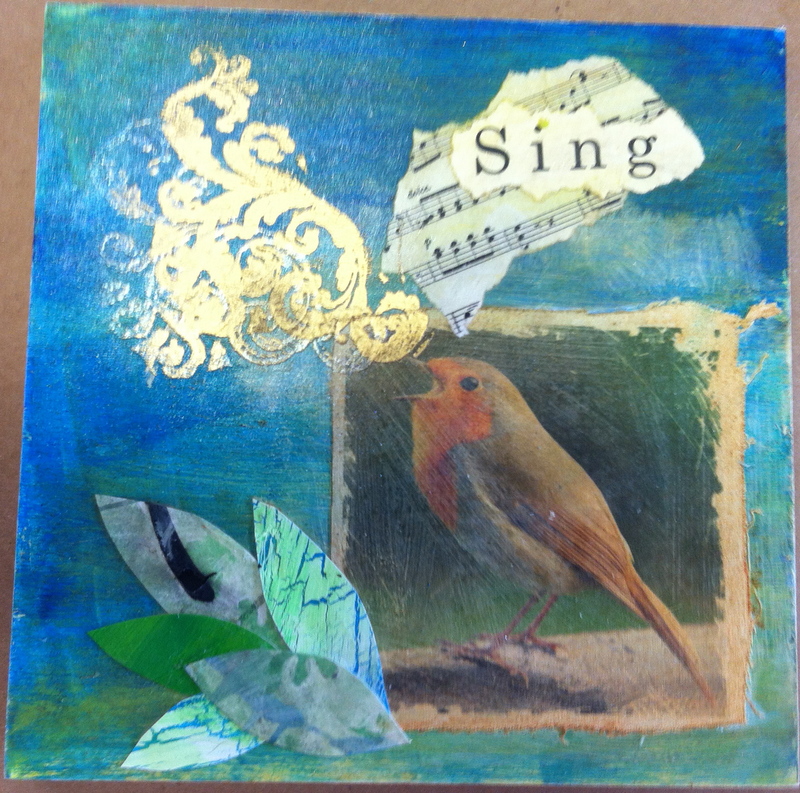 Her introduction class was titled “Put a Bird On It”, and we were to spend the day using bird imagery and themes to explore the different techniques and possibilities creating work on paper, paperboard and wood. After Trish and I fortified ourselves with the thermos of coffee I brought and some home made cinnamon rolls I baked the night before, we were ready to get to work. Of course, I couldn’t just “put a bird on it”, I had to use goldfish! 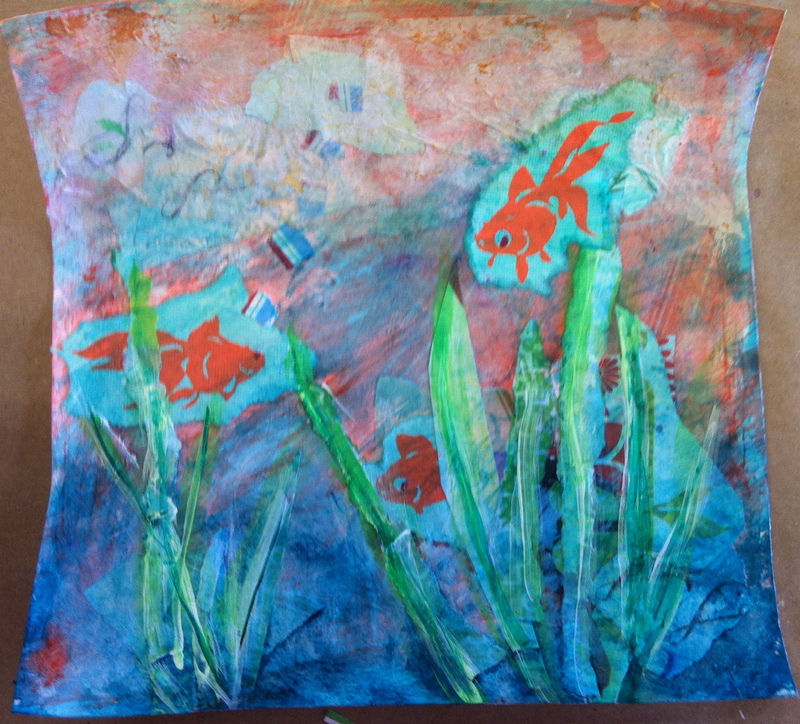 There was a wonderful handprinted wrapping paper in the paper box with big fat goldfish on them, and it made me want to create something for Rolland as he loves blue and orange. Thinking the collage thing would be really easy, I started ripping and pasting to my board (OK, it’s actually a gel matte fixative, but I call it pasting). I had the fish hiding in some weeds at the bottom of what I thought was going to be a fishbowl, complete with fishy air bubbles. It didn’t look so great. Caitlin gently got me to think about a couple of ideas to make more of a composition from it – adding another fish, less of a highlight on the air bubbles, more of a “horizon” line toward the top – and she was right on every one of them. I added a light wash of yellow and the whole thing popped in a way that made me like the piece instead of wanting to chuck it. On to Bird piece number 2. For me, that was a SOCK MONKEY! I’ve been saving paper stuff with sock monkeys on it for a couple years now, thinking one day I’d find a use for them. I had this idea of doing a tree with some monkeys hanging from it, but it evolved into a house. I don’t think a sock monkey house would look like a regular house, so I gave it some cartoony, angled walls, roof and window frame. My original plan to have three monkeys in the house made it too crowded and busy, so I chose my favorite guy (from a calendar of vintage sock monkeys), and had him looking out the window. A tree next to the house was the right addition – highlighted with some yellow to make it pop – and I added a door step in some hand-marbled paper I made WAY BACK in college when I was studying book binding and decorative papers. 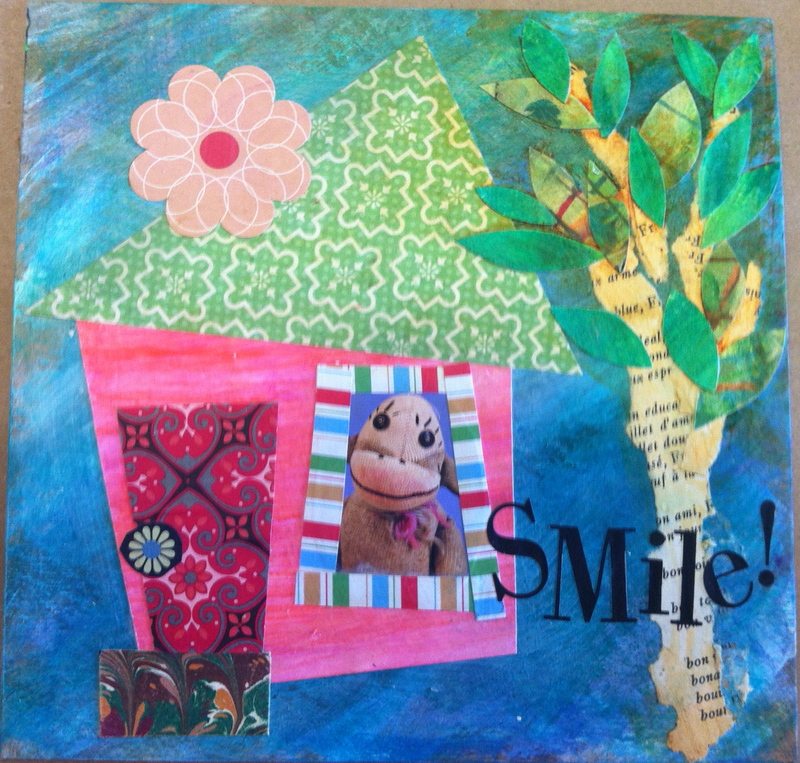 And last, I added SMile! to my piece, because that’s what always happens when I look at sock monkeys for awhile. So the afternoon was winding down, and I’d yet to do anything with my bird! I decided to just crank it out and not overthink it, and I really wanted to finish my project DURING CLASS because the last thing I needed to take home was another unfinished ANYTHING. I’ve been working on this children’s book lately where the main character realizes the way out of his problem is to sing, so I wanted a little bird with SING on the piece. I’d prepped my board with blue and green (I love blue and green! ), then I used this very cool technique of transferring my bird image onto fabric before I glued it down. A few leaves cut from a spin painting I’d done at the fair years ago, some music notes, lettering, then my final touch: a pearly, embossed swirl with the same embossed swirl over it in gold. I wanted it to look like that was the song coming from the bird, and I like how it turned out. A fun, fun afternoon creating really gets my blood pumping, and the collaging techniques let me get a little bit dirty, but not so yucky I couldn’t get cleaned up in a few minutes – it’s so fun to get messy! Trish and I both came away with pieces we loved, and she’s getting ready for a BIG collage project, which I could tell was really starting to gel in her head during this class. I think she’s going to create something wonderful with vintage photographs of her family and I can’t wait to see it. And now I know what I can do with all that vintage wrapping paper, funky paper scraps, ticket stubs and old photos I’ve been saving – make some more art!